The World's Latest Flame Photometer with Dual Channel Capability which can measure up to four elements, now including calcium. The Model 425 Flame Photometer builds on the great success of the Model 420 Flame photometer with its Lithium Internal Standard and fully automatic ignition and optimisation which gives true ease of use and reproducible conditions for high precision measurement. 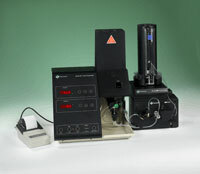 The versatile Model 425 Flame Photometer reinforces Sherwood Scientific as the Leader in Flame Photometry.